Prefer to spread your hummus rather than use it for dipping? 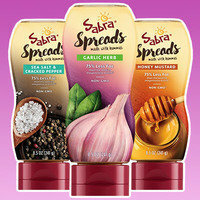 Then you'll love these super-smooth, flavor-packed, hummus-based condiments that come in squeeze bottles. We sure do! In Garlic Herb, Sea Salt & Cracked Black Pepper, and Honey Mustard, a little goes a long way. Find it at retailers nationwide in the hummus section. COOL PRODUCT ALERT! 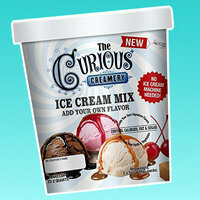 With this mix, you can create your own personalized ice cream without any fancy equipment. Yes, really! Just add your liquid of choice -- think water, milk, or juice -- and any flavor add-ins you like. Then simply mix, freeze, and enjoy. We made a tasty low-cal combo with coconut water and pineapple, and we can’t wait to try more. Click to locate, or just order on Amazon. 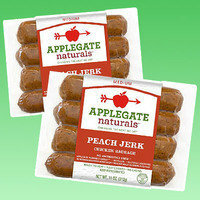 Oooh, Applegate is getting creative with its sausage! This variety features real peaches and authentic Jamaican jerk spices. YUM. We'll be tossing these onto our grill pan long after summer ends... Click to find. Here's how to get a 100-calorie version of Starbucks' new drink, the Chile Mocha! Science reveals the most satisfying starchy-carb indulgence. If you're gonna splurge, you might as well do it right! A small study looked at which carby side dishes had the highest satiety rating, comparing pasta with four different preparations of potatoes -- baked, mashed, wedges, and French fries. While each side dish had the same number of calories, the study found that the fries were significantly more satisfying than the others! Fair warning: In the real world, not all restaurant side dishes are created equal in terms of calories; the fries are likely to be highest in calories. What does the word "healthy" mean to you? The International Food Information Council Foundation recently released results of its 2016 Food & Health Survey, and there's some interesting data. Of those surveyed, 35 percent define "healthy" as "does not contain (or has low levels) of certain components", things like fat and sugar. And when defining a healthy-eating style, 26 percent chose "moderation/serving size & portions" for their top criteria; 25 percent said that healthy eating "includes certain foods I define as healthy." What do YOU think? What does "healthy" mean to you? And that's all we've got. 'Til next time… Chew the right thing! Ahoy and happy Talk Like a Pirate Day, September 19th! Arrrrrrgh, if ye lookin' for a good piratey snack, ye might want to give Pirate's Booty snacks a try. From DIY ice cream to the most satisfying starches, today's news is too good to keep to yourself. Click "Send to a Friend" now!